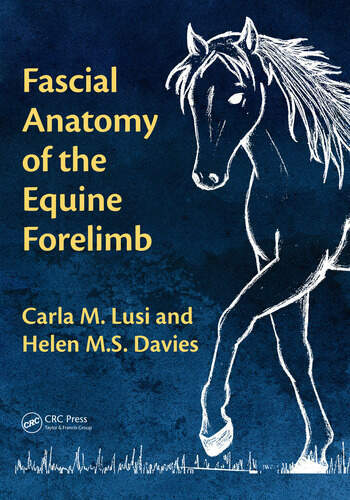 The first book in equine anatomy to illustrate the fascial (soft connective tissue) connections of the equine forelimb. Clear, high-quality images (with reference images included on each page) help readers identify aspects of the limb photographed. A brief introduction to the forelimb musculoskeletal anatomy (with images) helps readers familiarize themselves with muscles and bones portrayed in photographs. Focused discussions highlight the practical applicability of the fascial connections illustrated. Accompanying video clips demonstrate connectivity of the fascial system particular lines of tension. The first of its kind in equine anatomy, this clear, concise anatomical guide illustrates the fascial (soft connective tissue) connections of the equine forelimb. Based on dissections of fresh equine cadaver limbs, it provides a visual map for equine physical therapists, veterinarians and horse riders, helping them to understand how pathologies, injuries, or movement abnormalities of the equine forelimb arise and/or progress from one area of the limb to another. The fascial system is one of the primary systems acted upon by equine physiotherapists and is of increasing interest to horse riders looking to achieve structural integration and balanced movement in their horse. With this in mind, key points in each chapter highlight everyday situations in which knowledge of the fascial system may assist in understanding horse movement and injury. This practically applicable anatomical atlas is the ideal reference for horse owners, body workers and veterinarians alike. Introduction. Fascia of the metacarpus and proximal digit. Fascia of the carpus and antebrachium. Fascia of the brachium and shoulder. Fascial lines of tension that extend into the hoof. Fascial lines of tension throughout the forelimb. Carla M Lusi (BSc, PhD) completed a Bachelor of Science at the University of Melbourne. Her PhD (supervised by Helen MS Davies) focused on mapping out the fascial connectivity in the equine forelimb. Helen MS Davies (BAgSci. MAgrSc. BVSc. PhD) is Associate Professor in Veterinary Anatomy, The University of Melbourne. Previously primary author on three anatomy chapters in “Equine Podiatry” (publ. Saunders 2007) and coauthored a chapter on hoof biomechanics in “Equine Laminitis” (publ. Wiley 2016 ). Extensive experience in the following aspects relevant to this proposal; teaching veterinary locomotory and regional anatomy to veterinary students and post graduate courses in physiotherapy and other associated professions (25 years); equine biomechanical and anatomical research (25 years); training horses and riders in all disciplines (40 years); treating and advising trainers and riders on the prevention and management of musculoskeletal conditions (25 years); measuring the development of changes in forelimb loading in young horses in training (25 years).